Chocolate Lab names are close to my heart and likely the easiest for me to list. Why? Because I have had a Chocolate Labrador Retriever for nearly 80 dog years. Her name is Bailey (one of the most popular Labrador dog names) and she is a wonderful companion. When you explore this dog names list, you might ask, “why did he pick that?” Good question. Many of the names will have an obvious reference to chocolate. Hershey, Brownie and Mousse, for example. Others may be a little less familiar words that also relate to chocolate. Wispa, a lesser-known chocolate bar made by Cadbury, Cailler, a fine Swiss chocolate, and Kopiko, a species of coffee plant unique to Hawaii and a brand of coffee candy. Finally, I picked some of the names simply because I liked them. When I was adding them each to the list, I pictured Bailey, my Chocolate Labrador Retriever, and wondered if I could call her by that name. More than you wanted to know? Chocolate Lab names still should match your dog’s personality and purpose. Do you have or want a hunting dog? Consider one syllable dog names as they are often better suited for giving voice commands. Mac, Kit and Sam are all good one syllable hunting dog names. If you don’t yet own a Labrador Retriever, visit our Labrador Retriever information page to learn more. This may also help you choose an appropriate name for your dog. Below is a list of more than 175 Chocolate Lab names. Take your time and have fun. If you don’t find a name you like, return to our Labrador dog names list, our Dog Names by Breed page to see more categories, or expand your search to our list of more than 4,000 puppy names. Do you have a Black Lab? Find a perfect name on our Black Lab dog names list. If you want or own a yellow Lab, explore our Yellow Lab names list. Can’t find the name you like on the Chocolate Lab Names list? Don’t give up. 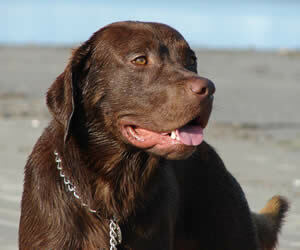 Return to the Labrador Dog Names page or our Dog Names by Breed page to do some more exploring. If you have a great name, tell us about it! Sometimes, the best way to get the perfect Labrador dog names is to ask a friend. Please share your ideas here for all to see. If you have a story to go with the name, please share that, too. Why do you like the name? Is this your own dog’s name? You get the idea.